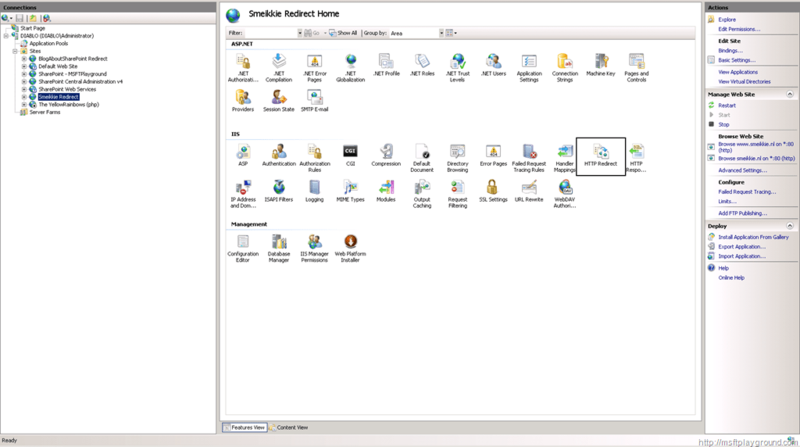 When I migrated my blog to my own Virtual Private Server I placed all of my articles on SharePoint Foundation. In order to also access my blog with the other url’s I created some alternate access mappings and changed the bindings within IIS. But what I really wanted was a Http redirection with a 301 status code. 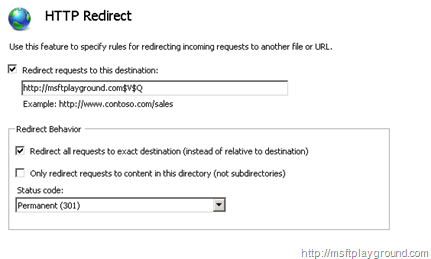 If you enable this by default in IIS you will be redirected to the top level. But it is also possible to redirect with the query string. Create a new website and add the binding you want. Add the url you want to redirect to and add “$V$Q”. To pass the query string. Also select “Redirect all request to exact destination. Hmmm does this also work for adding a prefix? Thank you for this, I just had my new domain in the destination box and the “exact destination” box unchecked, which worked for most of my pages. I only just realized that didn’t include query strings. Just wondering where the documentation is for this? Or how you figured it out? Thanks! Sorry, can’t remember how I figured it out it was a long time ago. Glad that it worked for you!